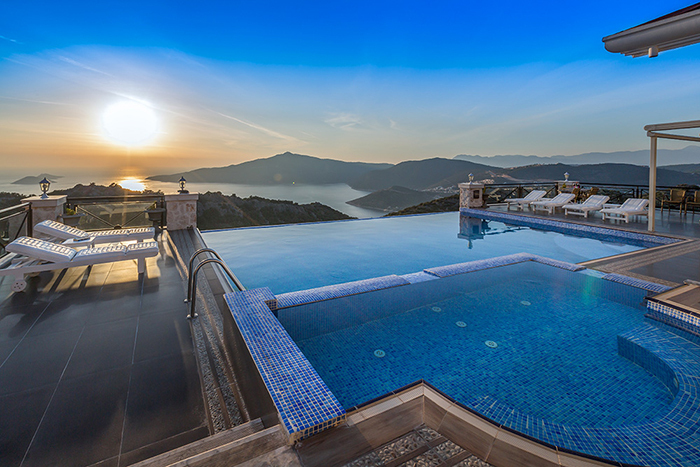 Described as the “jewel in the crown”, Aria near the town of Kalkan on the Lycian Coast in Turkey is an incredible home, positioned in the most magnificent of spots. We have to admit, this six bedroom, six bathroom property is quite simply the best of the Vintage Travel portfolio. Swathes of space give 11 guests ample room to spread out as this huge estate is one of the largest private estates on the Lycian Coast. Incredible views of the rolling Turkish countryside that stretch towards the Turkish Mediterranean Sea and Kalkan Bay surround this tremendous home, encroaching into every room via the property’s large glass windows. The principle bedroom goes one step further with floor to ceiling glass and its own en-suite swimming pool! Though that is just one of many fabulous and utterly unique features in this home that is fit for royalty. The fountain in the hallway takes some beating for a feature that compels you to say “wow”! For guests wanting to get active on their Turkish break, there’s plenty on offer in Aria to help you burn off those holiday excesses, including an air-conditioned gymnasium, a hammam, a sauna, a floodlit tennis court, a Jacuzzi and an infinity-edge swimming pool that seems to blend into the stunning natural backdrop like nature intended. The views this splendid villa enjoys are there to be soaked up on the exterior dining terrace with a barbecue. Open and shaded terraces enable guests to either lay out under the Turkish sun overhead or enjoy shade and relaxation from this outstanding spot. If you can manage to drag yourself and your party from the beautiful confines of Villa Aria, you can enjoy a day on the beach, which is just 9 kilometres from the house. The nearby town of Kalkan is waiting to be explored, brimming with historical sites, quality restaurants, verdant nature, ancient architecture, and warm traditional Turkish hospitality, all with the absence of mass tourism. For more information about this splendid Turkish villa, to view photos and to check availability and make a booking, visit the Aria webpage on our site.